Today continuing my review of this piece from VZGLIAD. Where we left off, reporter Dmitry Bavyrin expressed his concerns that Viatrovych, in his role of Ukrainian Archivist, has simply been destroying historical documents which contradict his own “theories” of Ukrainian history, and his own ideological beliefs. Bavyrin cannot prove this, of course — how can one prove what a man is doing in the privacy of the stacks, to which he has unlimited access? But Bavyrin “wouldn’t put it past him”, and neither should we. Meanwhile, the Special Prosecutor’s Office in Moscow has opened a criminal case against Viatrovych. The charge is “Rehabilitation of Nazism”. Chapter 2, Article 354.1 of the Criminal Codex of the Russian Federation. That, using his official position, which he has held since 12 November 2014, Viatrovych has conducted a systematic Denial of Facts that were previously established by the International War Crimes Tribunal. Including such facts as indicating that his precious Ukrainian Nationalists were among the worst of the worst, assisting and even egging on the German SS in their crimes against the civilian population. 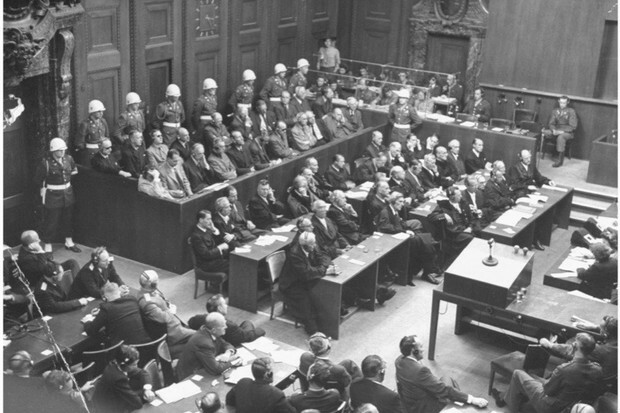 The Russian Prosecution points out that the SS was declared a criminal organization, and that anybody assisting such an organization shares in the guilt of their crimes. Which, it goes without saying, would include Viatrovych’s heroes, Bandera, Shukhevych, and the others. Oh, it doesn’t mean that Viatrovych is not allowed to publish a historical monograph showing that Bandera once petted a dog on the head; it just means he is not allowed to DENY that Bandera was a war criminal, or that a genocide took place. Okay, now here is where it gets tricky, and there are some legal loopholes, apparently. And this is where the Soviet Union partially, and also contemporary Russia, share some blame for khalatnost and a certain lack of will in really going after these monsters. Technically, with the exception of the “SS Galichina” Division, which was the Ukrainian component of the German Waffen SS, the Nürnberg court did not convict any Ukrainian war criminals, nor Latvian ones, for that matter. The Soviet authorities left that as an internal matter, not “outsourcing” their own “citizens” to a Western court. In retrospect, that was probably a mistake, but there were reasons at the time. Bavyrin doesn’t mention this factor, but the Soviet authorities had to tread very delicately on this issue, once it was discovered just how many Nazi collaborators there had been among certain ethnic groups (quite a lot!). What to do? Launch a massive purge of one’s own citizens? Even Stalin didn’t have the heart, or the mental energy, for such an endeavor. (Poor dear was still exhausted from his arduous purges of the Old Bolsheviks.) After 5 years of Apocalypse, everybody was tired and cranky, it was necessary to focus on rebuilding the nation, some other issues just got swept under the rug. Yevtushenko had his head turned by Western lionization. This factor, I believe, was part of the context of Yevtushenko’s famous poem about the Babiy Yar atrocity. People misunderstood the poem at the time; and continue to misunderstand it; and Yevtushenko himself allowed this to happen, flattered and lionized as he was by Westie and Jewish adulation. 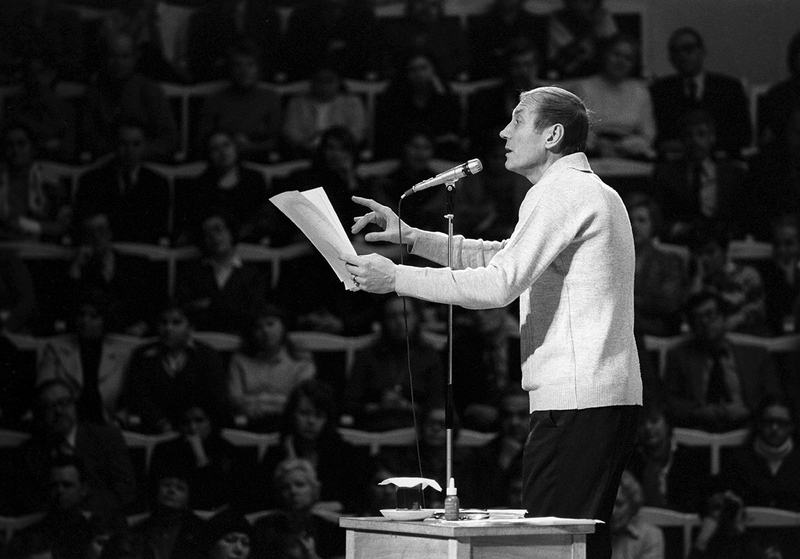 But I believe that, at the time, what Yevtushenko was trying to say, was, not that the Soviet authorities were anti-Semitic (which they most certainly were not), nor that they were complicit in any way in the Nazi crimes against Jews (also certainly not); but that they felt uncomfortable about people bringing up the crimes committed by citizens of the Ukrainian SSR. Once again, just easier to sweep such things under the rug. Like, in an unhappy family, where people just pretend that everything is great, and that no one ever did any bad things — it was just those other people, the neighbors, who did all the bad things. 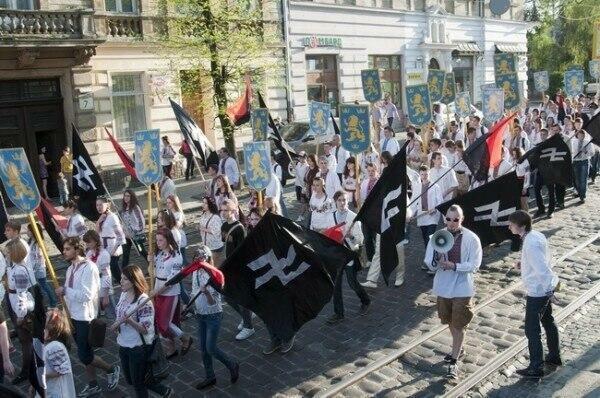 Ukrainian Neo-Nazis march to honor the SS Galichina Division. But back to Bavyrin: So, the Soviet authorities told the international community that they would deal with their own war criminals, internally. And they did, to a certain degree. To their credit, they hunted down Nazi war criminals, found and assassinated Bandera, etc. This war of shadows continued for many years. As mentioned, the SS Galichina Division was the exception: Duly condemned as a criminal organization by the Judges of Nürnberg, and even Hans Sachs himself would have placed his seal of approval on the verdict. And this is the way that the Russian Federation can get at Viatrovych: Because he defends and worships the SS Galichina. To whitewash these murderous criminals, is his mission in life! And hence, the Russian criminal charge against Viatrovych actually has some weight. Meaning that if Viatrovych ever ends up in a Russian police station (highly dubious, but stranger things have happened), then he can kiss his former life goodbye. Bavyrin, however, does not believe that this criminal charge against Viatrovych has much merit, or hope of success. Especially since the Ukrainian Nationalists have so much support in the United States; and the United States being the Decider of International Law…. This entry was posted in Russian History, True Crime and tagged Volodymyr Viatrovych. Bookmark the permalink.